I've been letting a few review records pile up, so I'm going to try to clear those out over the next few days. I haven't been dragging my feet on them for any reason other than I just have had so many records from Japan to get through. Just a warning, I'm no where near close to done with those either. Beasteater was sent to me by the folks over at Big Neck records. I was pretty excited to get a package from them as I had really enjoyed the Danger Signs album they had put out. 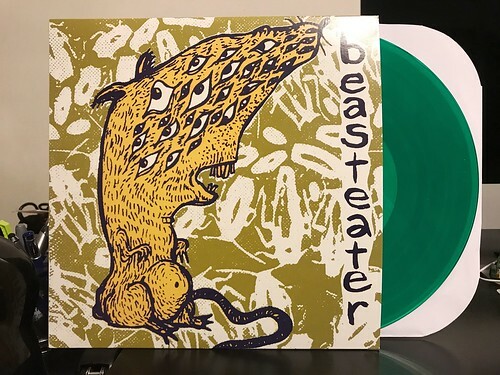 I wasn't familiar with Beasteater prior to putting the record on, so I wasn't exactly sure what to expect. I definitely don't think I was expecting something so loud, though I guess with the word beast in their name I should have been expecting some sort of roar. The album starts off with "The Night Air," which I can only describe as fury crammed into two minutes. The sheer chaos and energy of this opener was pretty eye opening, not just for the ferocity, but because the song still managed to retain some semblence of a hook that drives the song forward. It reminded me a bit (just a bit) of some of the noisier, freakout moments of Rocket From The Crypt. From there, the band takes their foot off the gas, just a little. I don't think an entire album's worth of songs at the level of "The Night Air" would be healthy. Beasteater churns out a respectable set of songs that are on the noisier side of the garage rock spectrum. Primitive pounding drum beats mesh with thick, chunky guitar riffs with wailing vocals guiding everything. If you're into some of the noisier things I write about from time to time, this would be up your alley.